The Goddess I Truly Am Inside? I Think I Ate Her. 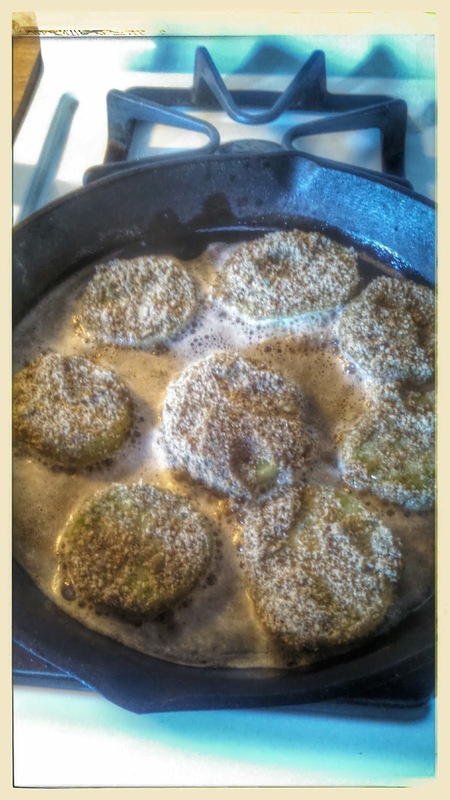 : Fried Green Tomatoes Paleo Style! 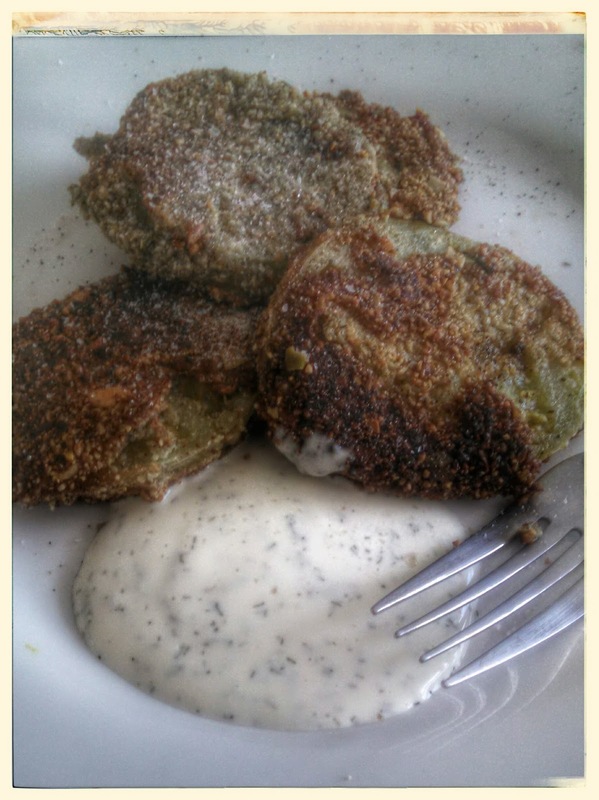 Fried Green Tomatoes Paleo Style! The fruits of my labor paid off. Despite having a horrible growing season, I did manage to have a successful tomato crop. However I did have to sacrifice a few from reaching their full maturation to make one my favorite Summer comfort food. I love Fried Green Tomatoes! Usually I would use a simple mixture of flour, salt, and pepper and egg wash. However that does not quite fit into my Paleo/clean eating. Tomatoes are a classified as a nightshade, and for some who are following an Autoimmune approach these are not for you. The verdict is out on nightshades for me. Thank goodness because it was time to get all Whistle Stop Café up in my kitchen. Tap into my inner southern gal roots and get to work. Since I was not using flour and am honestly getting a bit tired of the go to almond or other but flours, I decided to use pumpkin and a bit of sunflower seeds. I put them n my handy dandy blender and chopped them down to a fine texture. Next I added Himalayan pink salt, pepper and my spices. Now here is the thing. I am a "sense" type of cook, I rely on smell and taste A Lot! So trying to nail down exact amount of spices prove to be difficult. I can give you a general measurement but I always adjust to my mood. After added my spices to the pumpkin/sunflower seed more mixture, I beat two eggs for the wash. Here was my other conundrum, eggs. We have our chickens, seven "Ladies of the Yard" to be exact. Well they have decided to take an early vacation it seems. They started molting, which in the chicken world can slow production. Or as my hubs says "they are in strike, Union workers." Well today I was able to find three fresh laid eggs to use. Yay!!! To fry these delectable num nums I just had to get the down home feel and use my cast iron skillet. I put about 4 Tablespoons of coconut oil and put it in medium high heat. Now watch it, cast iron heats fast! Bless our ancestors hearts using them over open fires! While the oil is melting, dip your tomatoes in the egg wash then into the seed/spice mixture. Coat evenly. Place the coated tomatoes into the skillet. Fry each side until lightly golden and the tomatoes become slightly soft. Use a fork or slotted spoon to remove the tomatoes into a paper towel to soak up the skillet extra oil. Salt and pepper them and serve. I served mine with my homemade Paleo Ranch dressing. Wash and slice Tomatoes 1/4 inch thick give or take. You do not want them too thin or thick so they can cook evenly. In a blender or food processor pulse the pumpkin and sunflower seeds to a fine consistency. Add to a medium bowl. Add all your spices. Add more or less to taste. Combine together. Whisk the eggs. Add oil to pan on medium heat. 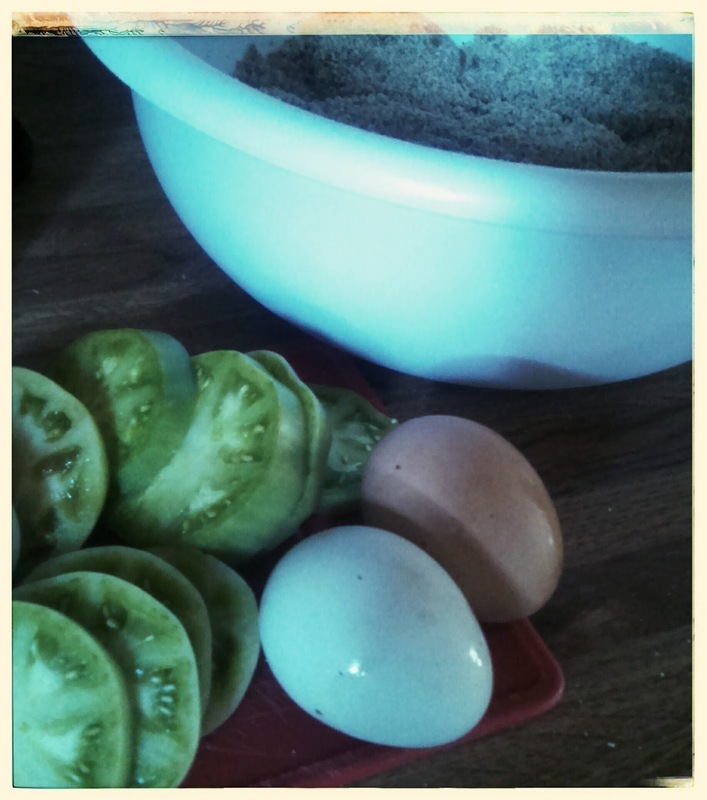 Dip slice tomatoes into the egg mixture then into seed and spice mixture. Coat well. Add to pan. Fry for about 1 to 2 minutes. Flip tomatoes and fry the other side. * I usually do the egg wash/coating step with a few tomatoes at a time. Drain on a paper towel. Salt and pepper tomatoes and serve. Use a paleo approved Mayonnaise or make your own. Add 1 cup of Mayo, 1/2 to 1 cup of full fat coconut milk, add dill, salt, pepper, onion powder, garlic, to taste. I add all to a pint size Mason jar apply the lid and shake to combine. Soooo...how'd it turn out with the nutty coating?